Back in 2010, the original Crazy Light was the shoe that drove the adidas brand’s weight-driven performance shoes. It carried over from basketball to football to soccer, as adidas’ sole goal was to provide the lightest weight footwear and performance products in each category. The brand’s designers cut weight everywhere via the use of layered synthetics with support in places where it was only absolutely necessary. This was achieved through the implementation of technologies such as SprintWeb (a weight-shedding composition for the shoe’s upper) and SprintFrame (a rigid, supportive, yet lightweight chassis). I remember first seeing the original CL, from the sketchwork to the first official pictures, and marveling at the low-profile midsole, the sculpted Sprintframe, the barely-there Sprintweb upper and the high-cut but slender silhouette. But this “adizero” push was a double edged sword. 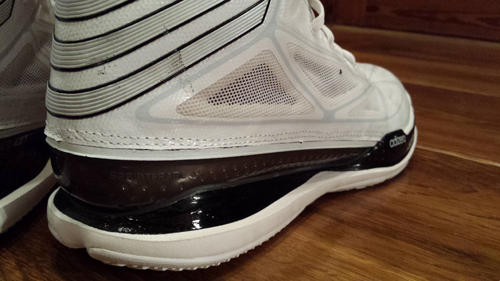 In its quest to provide the lightest footwear products on the hardwood, the Crazy Light has succeeded. 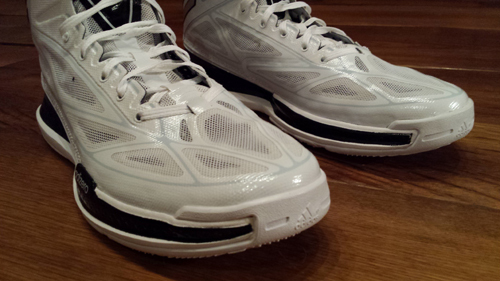 The Crazy Light 1 broke the 10-ounce barrier, weighing in at 9.8 ounces in a size 9. The Crazy Light 2 dropped that to 9.5 ounces, and the CL3 clocks in at 9.4 ounces. The reduced weight played great on court because the shoes also packed quite a bit of ankle support into such a lightweight shoe. But I personally felt that the cushioning, inherently pretty thin (a requirement to achieve such a light weight), just didn’t give me enough impact protection or midfoot support – especially after a few weeks of hooping. Props to adidas for using premium foam for that midsole and getting as much impact protection out of such a thin profile, but it simply wasn’t enough for me and it took a toll on my knees after a while. I also was never fully satisfied with the fit, which seemed compromised by all the webbing that didn’t quite flex naturally with the foot. As I found out, those same issues cropped up again in the Crazy Light 3. As with most aspects of this shoe, I have mixed feelings. On one hand, I’ve always been a fan of the SprintFrame tech because of the sculpted fit and solid lockdown it gives you. 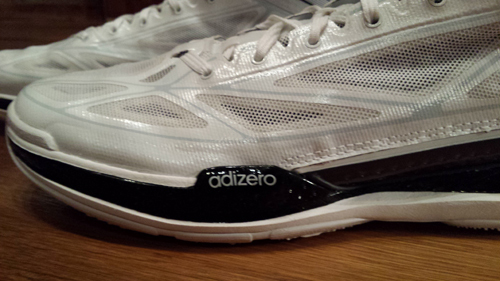 The CL3 Sprintframe was excellent again, providing quality heel lockdown. A more padded and molded interior collar also gave a nice fit around the ankle. 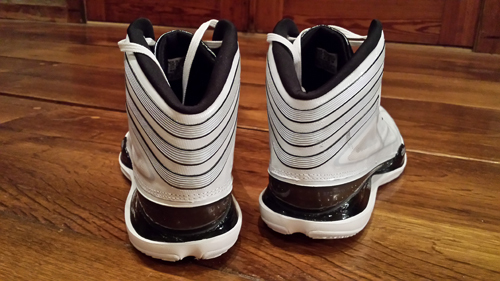 The outsole and midsole also appear to be slightly wider through the midfoot, which is a welcome development given how narrow shoes such as the Crazy Light 2 and Rose 2 had been in the past. I have an extremely narrow foot but some adidas models in the past were so narrow underfoot that I felt like I got no torsional support. The CL3 was certainly better in this department. But I felt I was never able to quite achieve a full lockdown through the midfoot because of the synthetic upper and Sprintweb combination. 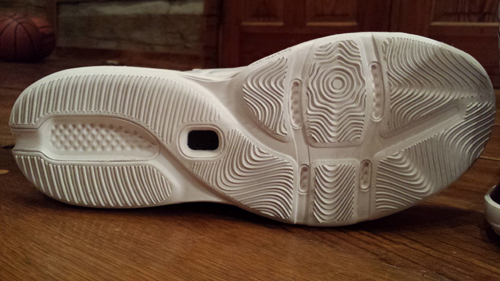 The supporting overlays placed along the midfoot and toebox never quite seemed to flex naturally. I hoped this would improve after several wearings, but even after 8-10 sessions I still wasn’t fully satisfied. It was also difficult to get the shoe to stay laced tightly and I found myself re-tying the shoes more than once during a 2-hour hoop session. I would feel my foot sliding around slightly, and that’s nearly a deal-breaker for me. It wasn’t terrible by any means, but compared to the Anatomix Spawn and Crazyquick that I’d be consistently playing in, it didn’t hold up. At $140, the price point comes into play too and I expect no excuses lockdown from a shoe like that. Transition was smooth as the shoe rides very low to the ground. I’m not sure what the heel-toe drop would be on the Crazy Light, but it figures to be fairly minimal and that lends itself to a pretty fluid heel-toe motion. There’s plenty of flexibility thanks to well-placed flex grooves and wavebone traction setup. This is probably always going to be a major point of contention with the Crazy Light and it’s really going to come down to the reviewer and your (the wearer) own preferences. My opinion is this: the low to the ground feel is great. I felt light, quick, uninhibited by the shoe. 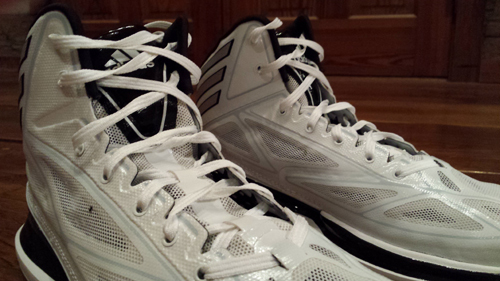 That’s a credit, again, to the high quality foam adidas uses to pack some cushioning in to such a thin midsole. 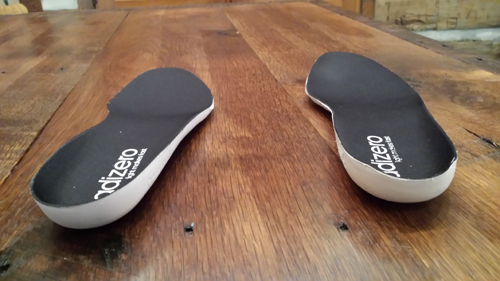 And the more dense Crazy Comfort insole (pictured below, on the right) does make a big difference initially, giving the footbed more padding and support. But wearing the shoe for an extended period of time really revealed the flaws, in my opinion. 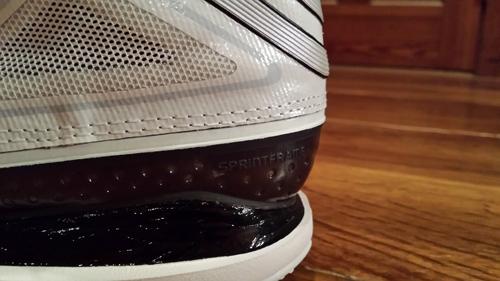 There simply isn’t enough impact protection in the shoe for my wearing needs. The Crazyquick, with the segmented midsole, also gave me great court feel but the quick zones, adiprene midsole and thicker rubber outsole allowed for just enough impact protection. The shoe moved with your foot so well, making the cushioning more responsive and, I think, helping to dissipate some of the impact from each footstrike. The Crazy Light didn’t feel as responsive to me and it felt like my feet consistently took the brunt of the impact. 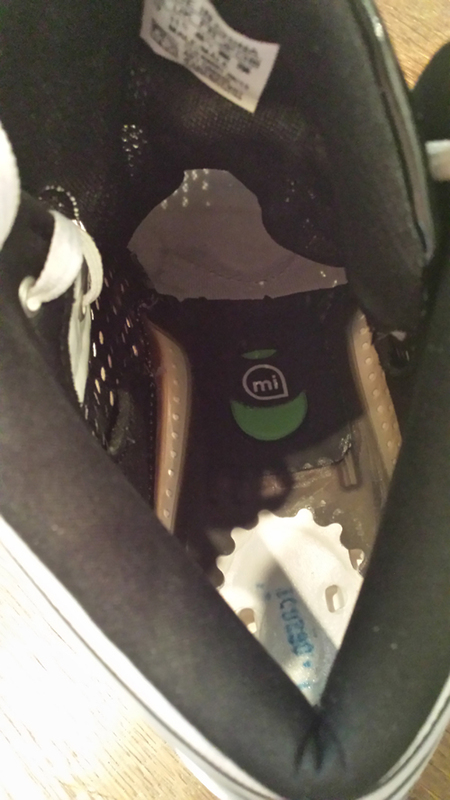 As you can see in the picture above, the only thing between your foot and the TPU Sprintframe is the insole. You can see the white piece underneath the heel and the forefoot, and that at least gives you some direct contact with the midsole. But the dark gray surrounding the white pod is the Sprintframe. An insole is going to get compressed and worn down rather quickly, and I found the impact protection to be rather harsh. The actual foam is fine, and is fairly responsive, but to me it just was too firm because of the frame. Wavebone is a version of the industry-standard herringbone pattern and it did an adequate job providing traction. I did find that it picked up dust on courts that were less than perfect, and I didn’t always get that reassuring squeak. But it was certainly very solid and I wasn’t concerned with losing my footing while making cuts or changing direction at high speed (your high speed is probably faster than mine but it’s all relative, right?). I touched on it before, but I didn’t love the upper synthetics because I felt like I couldn’t achieve full lockdown. I understand these are used in order to keep the weight down and thus make it a Crazy Light, but I’d like to see them softened up or at least placed a little differently in order to allow the proper flex. Besides that, I didn’t see too many issues crop up. The midsole foam is high quality and the Sprintframe heel counter is solid, while the rubber compound used on the outsole is relatively soft but provides good traction. Bottom line, the Crazy Light is a shoe that some of you will probably really like. You can’t go any lighter than this and the shoe allows you to play low to the ground and quick on your feet if you’re that type of player. But if you need impact protection at all or want a shoe that really forms and fits your foot well, I think there are better options out there. I liked the CL3 better than either of the first two Crazy Light models but there were too many shortcomings to make it one of my favorites of the year.